Conditions: Lot of humidity, 3°C, no wind. After a heavy rain, the sky suddenly went cristal clear. So I took my Dobson to a dark lane. After having a long M82 supernova contemplation, I payed attention to Jupiter. Its moons were in a rare configuration: all on the same side, but forming a trapeze instead of a line. From left to right: Io, Callisto, Ganymede, Europa. I was surprised by the amazing sky quality, seeing perfectly the Great Red Spot and some detail on tropical strips. I saw an unusual white wave on the right side of the GRS I wanted to keep in memory by doing this sketch. I could not establish if it was a continuous stream (as I draw it) or a suite of white storm clouds. 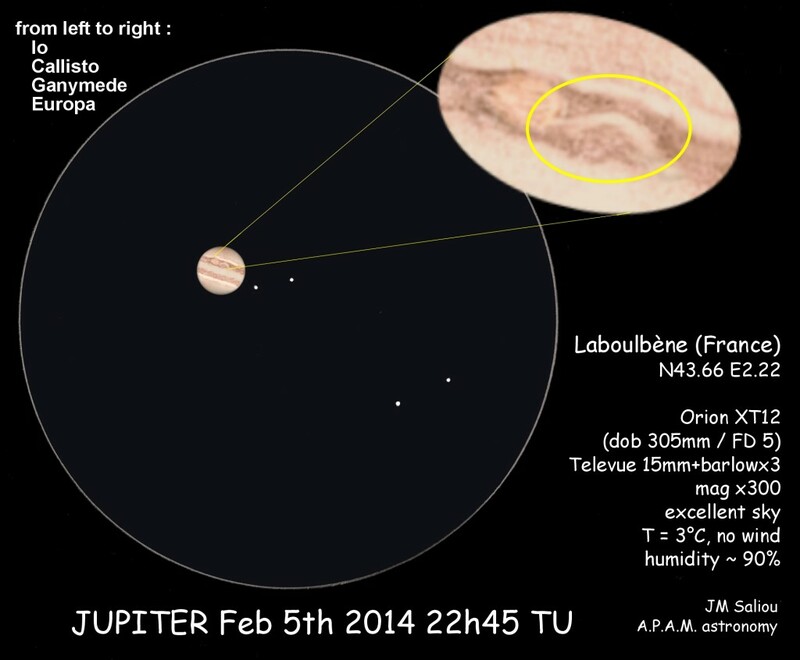 I did not find recent picture of Jupiter to confirm. If somebody observed this, or made a picture at the same period, thanks for leaving a comment. Very fine details in this wide field, moderate power sketch. first thanks for your sketch. It looks real good. Show us more! I just witnessed the birth of a storm on Jupiter ! Thanks Uwe, very interesting indeed. But I just see the thumbnail, I must be logged on the forum to see the full size.